As a full service veterinary hospital in Clarksville, St. Bethlehem Animal Clinic has offered cutting edge, affordable care to pets in and around Clarksville, Fort Campbell, Oak Grove, Guthrie and Montgomery County, Tennessee for more than 25 years. It has been our goal since day one to offer and provide the highest level of veterinary pet health care in our community so that every pet has the opportunity to live a long, healthy and happy life. To that end, we offer the best veterinary medical services to be found anywhere in the Middle Tennessee area at a very reasonable cost. 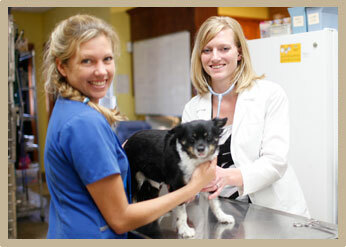 The focus of our care is on preventative veterinary medicine. As medical professionals, we understand that if we are going to give your pet the best shot at a long and healthy life as well as to keep the cost of care to a minimum, that we must prevent disease before it occurs. This is why we offer Life Stage Veterinary Wellness programs individualized to your pet's age and life circumstances. We also offer services designed to promote lifelong health, such as nutritional counseling, microchip lost pet ID, and vaccines. We also see it as our mission to help strengthen the bond you share with your pet, which includes behavior counseling, especially for a new puppy or kitten, as well as boarding and grooming services that far exceed those offered at other animal hospitals. St. Bethlehem Animal Clinic knows too that our medical knowledge and expertise, as wide and deep as it may be, is of little use if we don't share it with you. The desire to provide the best care as well as strengthen the human/animal bond is why we work hard at being good communicators. We need to listen to you and your concerns as well as provide you with information to be the best caretaker for your pet possible. Should your pet become ill or injured, we are here to help. Our diagnostic, medical and surgical capabilities are the finest to be found anywhere. We will provide you with treatment options that meet the health needs of your pet and match your family's budget. We are very proud of our Clarksville veterinary facility and are more than happy to provide you with a tour so that you are sure you have found the right home for your pet's care. Please give us a call today and come in to find out why we have so many happy and satisfied clients. An ounce of prevention is most certainly worth a pound of cure when it comes to keeping our pets healthy and limiting the lifetime cost of care. As medical professionals, St. Bethlehem Animal Clinic knows that the cornerstone of any preventative care program for your pet is a regular and thorough wellness exam. A nose-to-tail medical exam will allow your veterinarian to assess the health of your pet, notice potential signs of trouble at an early and easily treatable stage, and offer important information on the care of your specific type and breed of pet. We also understand that the preventative health needs of our pets varies and changes as they age. What is necessary for a kitten may not be the same for a cat in his or her later years. Therefore, we have created wellness programs targeted to your pet's stage of life and individual life circumstances that include everything necessary to maintain your pet's health and wellbeing. Additionally, since we understand that cost can impact the accessibility of our care, we have done everything possible to keep costs low. We also will not pressure any client into a care choice that they feel is unaffordable to them. When you bring your pet in for a routine wellness exam at St. Bethlehem Animal Clinic we will do all that we can to ensure your pet's preventative health care needs are fully met. This includes tailoring our care to your pet's age and life circumstances as well as the diseases and health threats common to our area of the country. Vaccines: Rabies and distemper are present in our region of the country and can not only affect your pet, but also your family. For this reason we offer these and other vaccines to our clients during their pet's wellness exam. However, we do not recommend every vaccine that is available. Some are simply not that effective while others treat diseases not seen in this area of the country. 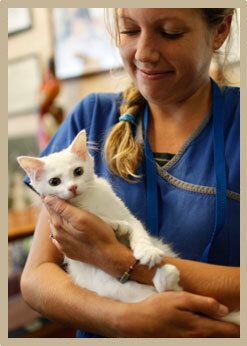 We will talk with you about the vaccines we believe are in your pet's best interests. Routine Blood Work: We encourage blood screening panels starting at age 3 and increase in detail as your pet ages. In order to keep the cost of blood work low, we have a program with ANTECH, our external lab, which provides a free heartworm test with even the smallest blood chemistry panel. 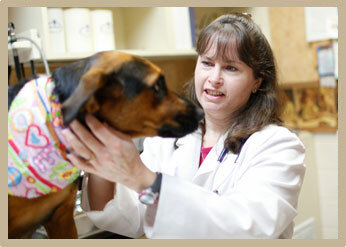 St. Bethlehem Animal Clinic also has a complete in-house laboratory for use as needed, especially in emergencies. However, we prefer to send as many labs as possible to ANTECH as this means a lower cost to the pet owner. Heartworm and Tick Borne Disease: Lyme and other tick borne diseases are prevalent in Montgomery County, Tennessee. It is also not uncommon for us to see heartworm positive dogs. For this reason, all dogs should be tested annually for heartworm. Preventative Medications: We recommend that all dogs should be on a yearly preventative for heartworm, fleas, and ticks. Cat owners should also consider a flea and tick preventative for their felines, especially if their cats spend time outside. St. Bethlehem Animal Clinic sells a variety of preventatives and would be happy to help you determine which is best for your companion. In all, these Clarksville veterinary wellness services offer the best mean to protect your pet's health and wellbeing through prevention and early detection of disease.